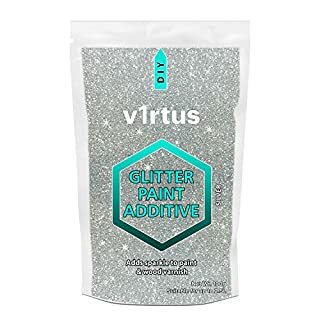 v1rtus Premium Unique Glitter Paint Crystal Additive 100g / 3.5oz is specifically designed, quality (Grade A) for the use with emulsion paints.Do not take the risk of buying substandard glitter, as this could ruin your paint project.★ Child Safe & Non-Toxic★ This pouch treats 1.5 litres / 0.33 gallons of emulsion paint (unbuffed)★ Registered Company & Business Seller★ We offer full product support if needed★ MSDS (Material Safety Data Sheet) can be provided if needed ★ Easily create amazing sparkling feature walls, chimney breast, alcoves etc.InstructionsSimple, quick & easy to use! Just sprinkle into any Emulsion paint (dead flat, matt, soft sheen or silk)Recommended Max ratioMetric - 100g per 1.5 litres (unbuffed)Imperial - 3.5oz per 0.33 gallons (unbuffed)Our 100g / 3.5oz pouch can treat up to 2.5 litres / 0.55 gallons of emulsion paint (if buffed when paint dry).Amazing if added to a clear glaze - Just add 50g / 1.7oz per litre / 0.22 gallonPlease make sure you order enough, to get the desired glitter effect that you want. This product will give you a super glitter shimmer up to 5% glitter coverage when buffed.FAQ'sWhat is buffing? Buffing is a quick & simple process. It is carried out by lightly rubbing a green nylon scourer over the dry painted surface, this will release thousands more crystals by knocking the head of paint off. In most cases this will increase glitter coverage from 1% - 5%. 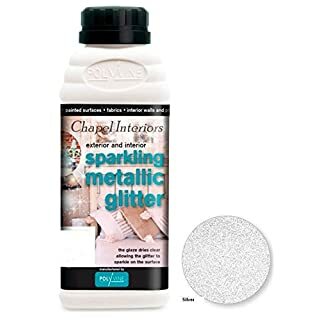 Glitter crystals additive provide a subtle shimmer to your latest decorating project. 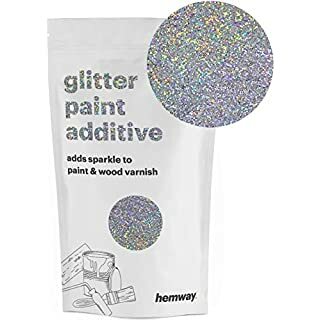 Mix these A-Grade glitter crystals to paint or wood varnish to create a wonderful, glittery finish to any object or wall. These glitter crystal work best when used with matt and silk emulsion paints. Using either silk, mid-sheen or gloss paint with this glitter will provide a more noticeable shimmer. Please avoid using with speciality paints such as egg-shell or gloss paints that are often marketed for a specific room. 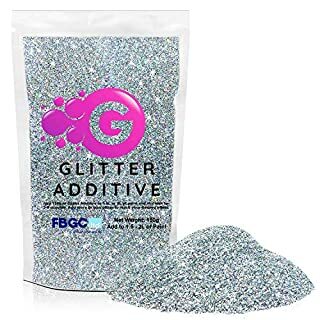 Incredibly simple and easy to use, just add 150g of glitter additive to 1.5L of paint (a 150g bag can also be used with 2L of paint) and mix well for 3-5 minutes. Add more or less glitter to reach your desired sparkling effect. It is recommended to do a trial by using a small amount of glitter and paint, before undertaking the full project. Once the paint has fully dried, try "buffing" your new surface by lightly rubbing a nylon scourer over it. This process releases millions more glitter-crystals by removing the head of paint, creating even more of a shimmer! In most instances, glitter coverage will increase by 1%-5%. Additional tips would include adding more glitter to less paint and changing the lightbulb in the glitter-painted room to "cool-white" as this provides a unique sparkle effect! 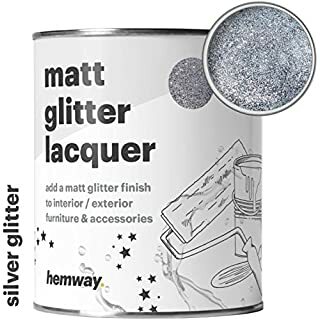 Hemway Glitter Crystals for Paint - 100G / 3.5OZ. These glitter crystals are QUALITY (GRADE A) FOR THE USE WITH EMULSION & ACRYLIC PAINTS (Wall, Ceiling Paints)DO NOT TAKE THE RISK OF BUYING SUBSTANDARD GLITTER, AS THIS COULD RUIN YOUR PAINT PROJECT.Child Safe & non-toxicRegistered SellerFull product support if neededTemperature Resistant up to 230°CTried and tested in different emulsion / acrylic paints (wall, ceiling paints)SDS (Safety Data Sheet) can be provided if needed Colourfast - Does not bleed, run, rust, or fadeINSTRUCTIONSSimple, quick & easy to use! Just sprinkle into any wall ceiling paint (Emulsion or Acrylic paints)Recommended Mix Ratio - 100g / 3.5oz per 1 litre / Quart Gallon wall or ceiling paints. 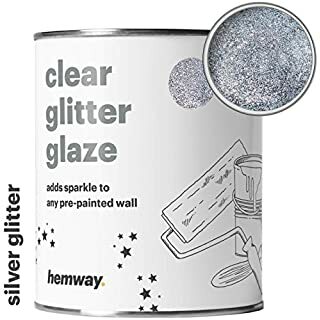 **IMPORTANT** If for whatever reason you do not see glitter sparkles once dry, then you will need to buff the dry painted area with Hemway Paint Buffing Pads - These will knock the head of paint from the glitter and unleash millions more glitter crystals!Amazing if added to a clear glaze - Just add 50g per litre.Please make sure you order enough, to get the desired glitter effect that you want. This product will give you a super glitter shimmer up to 5% glitter coverage when buffed.FAQ'SWHAT IS BUFFING? Buffing is a quick & simple process. It is carried out by lightly rubbing Hemway paint buffing pads over the dry painted surface, this will release thousands more crystals by knocking the head of paint off. In most cases this will increase glitter coverage from 1% - 5%. 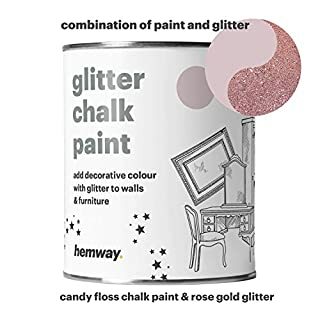 CHOOSE YOUR PRE-MIXED GLITTER COLOURWe will add the glitter colour of your choice to the Chalk Paint and PROFESSIONALLY mix it together for you. 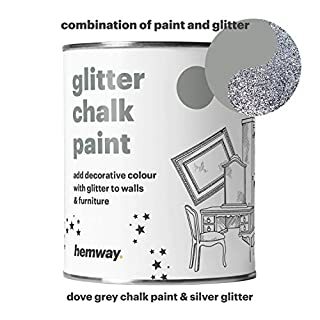 Simply select your favourite glitter above.★ Ultimate Glitter Sparkling Paint★ FAST SHIPPING TO WORLDWIDE CUSTOMERS★ Child Safe (when dry)★ UK registered seller★ Tried and Tested - over a wide variety of different painted walls and furniture★ FAST SHIPPING TO WORLDWIDE CUSTOMERS★ GUARANTEEDRenovate and transform your walls or furniture with Hemway's Premium Glitter Chalk Finish Paint. This will give you a classic, smooth touch, flat matt sparkling finish. To create a distressed sparkle look, simply apply two contrasting colour coats, then use sand paper or scouring pad when the paint is dry.InstructionsWe recommend using a brush or roller. Use a 2-3inch paint brush, applying a criss-cross motion to give an even spread. Allow 2 hours to dry between coats. Once dried, use a clean cloth and gently wipe over the painted area, in circular motions. 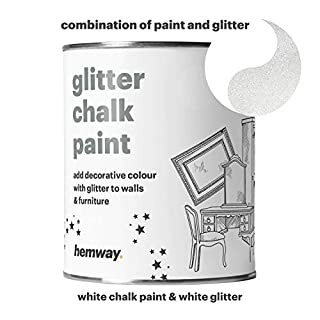 This buffing technique will knock the head of paint from the glitter, unleashing millions of glitter crystals.Hemway Glitter Chalk Paint is non-solvent, but ensure good ventilation when applying. 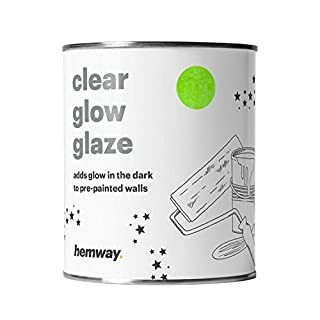 Not recommended for outdoor use, unless coated with Hemway Clear Satin Lacquer or Hemway Clear Matt Lacquer, you may also use this to protect indoors. 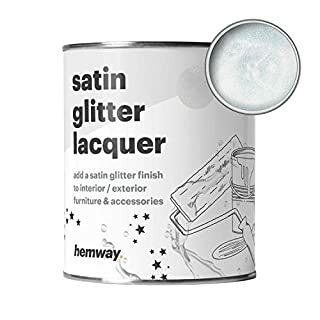 If you would like to add more glitter sparkle to your dried finished project, use Hemway Satin Glitter Lacquer or Hemway Matt Glitter Lacquer (various glitter colours available in both products). Hemway Phosphorescent Luminous Neon Glow Pigments in Yellow Can be MIXED into with Hemway Clear Glitter Glaze, Hemway Satin Lacquer, Hemway Matt Lacquer, Hemway Exterior Matt Lacquer, Hemway Exterior Satin Lacquer, Hemway Matt Glitter Lacquer, Hemway Satin Glitter LacquerLooking for a way to give your next project that "certain something"? 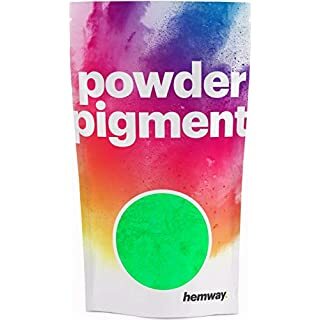 World-wide best-selling phosphorescent glow pigments by Hemway are just what you're looking for! No matter if it's an art project or a DIY paint-job at home, these pigments are the best way to an eye-catching new piece of decoration.Details:• Charges under direct light sources and glows in the dark• Over 200,000 satisfied customers• For art projects, DIY paint-jobs at home, black light theatre, murals, and many other occasions• Can be used both indoors and outdoorsApplication:1. Mix the pigments with binder in a 1:2 ratio (1 part pigments, 2 parts binder).2. Solvent-free binders such as clear coat or wallpaper adhesive are great cost-efficient binders for indoor use. Solvent-based binders such as synthetic resin are best suited for outdoor applications.3. Charge under a direct light source.Tip: The pigments can also be mixed in with paint to create a glow effect. Be sure to use a greater ratio of pigment when mixing it with paint. Alternatively, the pigments can also be used as dust/powder.ATTENTION!This paint is not to be used on skin or fabrics!